Wheatgrass juice has been hyped for years as a powerful superfood. It was even a staple in the diets of the ancient Egyptians and Mesopotamian civilizations. Contrary to its name, though, there’s no wheat in wheatgrass—it’s simply the young grass from the wheat plant (Triticum aestivum). It grows outdoors throughout the U.S. and Europe, but it can also be grown indoors on trays. The benefits of wheatgrass juice are seemingly endless (1). Wheatgrass was first popularized in the 1930s by American agricultural chemist Dr. Charles Schnabel.Schnabel and his research team found that wheatgrass was more effective at improving the health of livestock than other nutrient-dense vegetables such as alfalfa sprouts, broccoli, and spinach. In the 1950s, Ann Wigmore, a whole-foods advocate and nutritionist, began juicing wheatgrass. She then founded an institute and began to educate others about plant-based foods. What is it about wheatgrass? For starters, wheatgrass is loaded with nutrients, especially chlorophyll (which is what gives dark leafy greens their color). In fact, it contains up to 70% chlorophyll. Wheatgrass is also a great source of many minerals, vitamins, and liver enzymes. It’s thought to contain 98 of the 102 elements found in soil, including iron, magnesium, selenium, calcium, potassium, zinc, copper, enzymes, and 19 amino acids. Wheatgrass also contains vitamin A, vitamin C, vitamin E, vitamin K, and B vitamins including B1, B2, B3, B5, B6, and B12. The following is a comprehensive wheatgrass nutrition chart for a one-ounce serving (or, a shot). It will give you further detail about some of the nutrients contained within wheatgrass. Cancer cannot thrive in a well-oxygenated environment. Wheatgrass can help prevent cancer by cleaning the blood. A study published in the Journal of Experimental and Clinical Cancer Research in 2011 suggests that fermented wheatgrass extract exerted significant anti-tumor activity (2). Also, a preliminary study published in the journal Nutrition and Cancer in 2007 found that wheatgrass juice benefits breast cancer patients by reducing some of the harmful effects of chemotherapy (3). The study included 60 breast cancer patients on chemotherapy. Wheatgrass is known to treat several types of diseases and conditions associated with the skin, including eczema, psoriasis, and sunburns. It can also treat acne and skin wounds by quickly regenerating skin cells. You can rub a frozen wheatgrass juice cube across scars or damaged skin, or dab the affected area using a cotton ball dipped in wheatgrass juice, and let it sit for about five minutes before rinsing and drying the area. Wheatgrass benefits weight loss as well. Wheatgrass juice or supplements can prevent weight gain by managing the thyroid gland, which is important in weight maintenance. The many nutrients found in wheatgrass also help you avoid cravings. Take a wheatgrass shot in the morning on an empty stomach to prevent overeating throughout the day. 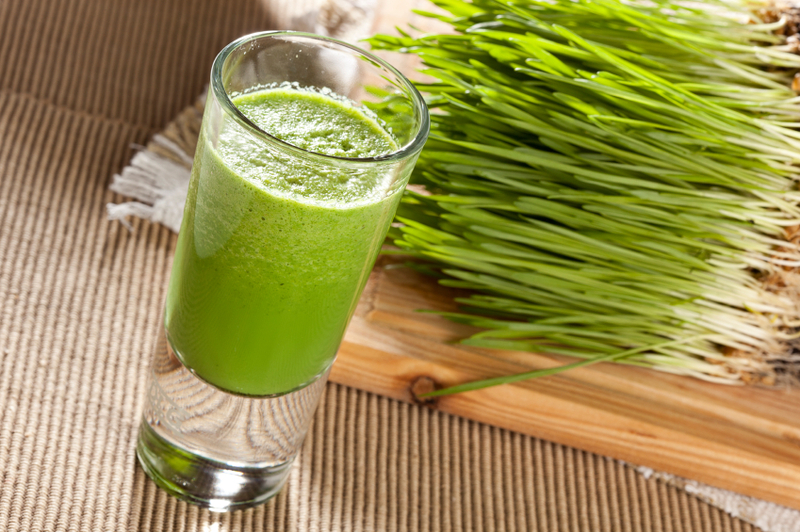 Wheatgrass juice benefits those with digestive disorders due to its enzyme, amino acid, and vitamin B content. It can help treat ulcers, irritable bowel syndrome, heartburn, and indigestion. A study published in the Scandinavian Journal of Gastroenterology (4) in 2002 also shows that wheatgrass juice can ease the symptoms of ulcerative colitis. There are also wheatgrass benefits for hair. Wheatgrass is thought to reverse gray hair due to its catalase content and other antioxidants, slowing the aging process. You can do this by drinking a wheatgrass shot daily, or by adding wheatgrass powder to a smoothie. You can even turn wheatgrass into an effective hair conditioner by juicing it. It’s also good for dry hair and dandruff. In a study published in the journal Indian Pediatrics (5) in 2004 involving patients with thalassemia, a blood disorder, researchers found that 100 milliliters of wheatgrass juice lowered blood transfusion requirements. On top of that, wheatgrass can increase the amount of oxygen in the blood, which stimulates blood circulation. 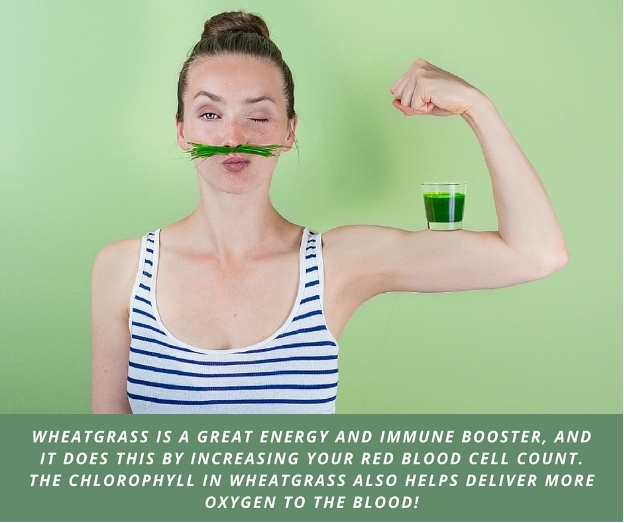 Wheatgrass is a great energy and immune booster, and it does this by increasing your red blood cell count. The chlorophyll in wheatgrass also helps deliver more oxygen to the blood, which prevents a weak immune system. Low energy is also linked to nutritional deficiencies, so taking wheatgrass will help eliminate general fatigue and tiredness. It’s also believed that wheatgrass can help treat arthritis due to its chlorophyll content. Chlorophyll is known to fight inflammation linked with joint diseases and other conditions. Wheatgrass is known for its liver detoxification effects. It helps protect the liver from oxidative stress, and cleanses it of foreign substances such as heavy metals. The B vitamins in wheatgrass can help you overcome anxiety and depression. Wheatgrass also helps prevent iron deficiency, which is linked to depression. Wheatgrass can be used as a natural deodorant. Wheatgrass and chlorophyll both act as natural deodorizers, and taking wheatgrass with other leafy greens can neutralize body odor. Regular wheatgrass supplementation can increase libido and stamina. A compound found in wheatgrass called P4D1 can impact sperm cells and DNA, and increase fertility as a result. Wheatgrass can benefit those who suffer from Alzheimer’s disease. The chlorophyll in wheatgrass fuels the body with oxygen, and oxygen is especially vital for the brain. In a study published in the Asian Pacific Journal of Tropical Medicine (6) in 2014, researchers found that wheatgrass powder had benefits in the treatment of Alzheimer’s disease through its antioxidant properties. Wheatgrass significantly reduced oxidative stress by enhancing the levels of catalase and superoxide dismutase in rats. Wheatgrass is also a potent remedy for heart health. In a study published in the journal Acta Poloniae Pharmaceutica (7) in 2011, researchers suggested that fresh wheatgrass juice can benefit those with atherosclerosis by lowering cholesterol; this also means that wheatgrass can also help manage high cholesterol levels. Besides juicing wheatgrass, you can also get it in tablets, powders, and frozen juices, but you can also grow it yourself (8). First rinse the seeds and then them for nearly 24 hours. After they have begun to sprout, plant the seeds on top of some soil in a two-inch-deep tray. Cover the seeds and keep them from drying out for the next three days. During these three days of growth, you will water them, heavily, once in the morning. On the fourth day, the roots should be taking over the soil. You will have to water heavily once a day while keeping the plant shaded from the sun. Begin harvesting once a blade splits into two. The average growing time is about seven to 12 days, and once harvested they can be stored in the refrigerator for about seven to 10 days. Wheatgrass growing conditions and improper care may also lead to the development of mold, which can potentially spoil it, depending on the type of mold. Wheatgrass can also be used as a mouthwash. Keeping wheatgrass in the mouth for about five minutes will help eliminate toxins, alleviate toothaches, prevent tooth decay, and treat bleeding gums. Always start slowly when incorporating wheatgrass juice in your diet. Begin with one ounce a day, and gradually build up to two ounces. Wheatgrass should also be consumed on an empty stomach, or with vegetables and fruit as part of a freshly squeezed juice. 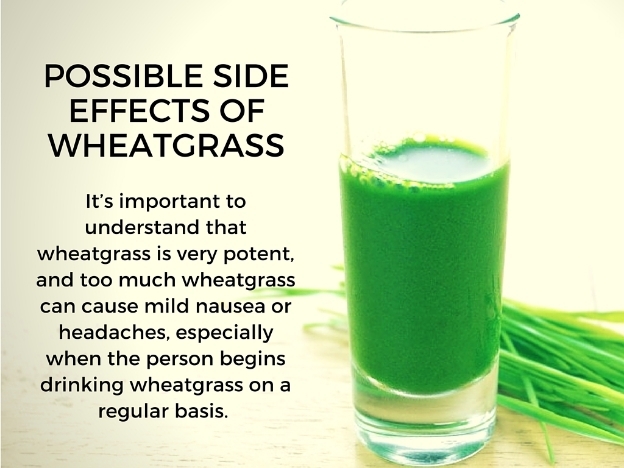 You may feel nauseated if wheatgrass is taken after a meal.